I just returned from an extended vacation in Colorado where I lived for 16 years. Near the start of our visit I spoke at the SMPS Build Business conference in Denver. My presentation was entitled "Marketing the Experience," a topic that is near to my heart. It seemed to resonate with others also, as people lined up to talk to me afterwards. I spent over an hour visiting with some of those who attended my presentation. The Experience Economy. What goods and services produce the highest profits? Those that deliver a compelling, valued customer experience. Think of the entertainment industry, adventure travel, theme parks, etc. Is this relevant to the AEC industry? Client research suggests it is. Over half of clients indicate that they value superior service (i.e., the experience) over technical expertise (which is considered a given). The Value Gap. Most AEC firms just don't get it. About 80% of them still believe their technical qualifications are what distinguishes them from their competitors. This misguided thinking creates what I call the Value Gap--the difference between what clients say they value and what most AEC firms think their clients value. Closing that gap presents what I believe is the best opportunity for differentiation in our business. Delivering the Branded Experience. As I noted in a previous post, your firm's brand is rooted in clients' experiences with your firm. The "branded experience" is characterized by its consistency, intentionality, uniqueness, and perceived value to the customer. Rare is the firm in this business (or any other) that can consistently deliver the branded experience. But don't be discouraged, because very few are even trying. The two most important steps to providing the branded experience are (1) developing and implementing a structured client service delivery process and (2) routinely soliciting feedback from clients about how you're doing and what you can do better. The fundamental goal? Make every encounter with the client a positive experience. Two critical objectives are reflected in this model: (1) focus on building relationships versus pursuing projects and (2) attract new business by serving not selling. I doubt you'll quibble with either objective in concept. But the real key here is that the vast majority of firms--in practice--do more project pursuit than relationship building and more self promotion than serving. That's why both sides of the sales transaction generally find it distasteful. 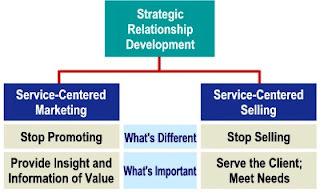 I outlined some of the basics of a service-centered approach to business development in two previous posts, one on marketing and one on selling. Expect more to come on this general subject. Free services or freely serving? Some attendees apparently zeroed in on my suggestion that a service-centered approach to selling is essentially an uncompensated phase of delivering service to the client. Does that imply giving away free services, something some find unethical? The answer, I suppose, is yes--to a degree. I certainly don't advocate doing anything that devalues your services (something many firms do routinely by bidding and discounting their work). Quite the opposite! Service-centered selling elevates the value of your services by demonstrating how well you'll serve the client. Think of it as offering a free sample of the branded experience. Consider this illustration: Would you buy a car without test driving it? No? Why not? Because you're not just buying the car; you're buying the experience of owning and driving that car. Similarly, the prospective client isn't just buying your expertise, he's buying the experience of working with you. Simply describing that experience is no more effective than watching a car commercial. Service-centered selling allows the client to sample the experience, and thus make an informed choice. So what is your firm marketing? Expertise? For the most part, that's a commodity these days. The branded experience? That's still a precious rarity.